Clare and I are incredibly excited about our England tour, “The Ascension of Avalon”, September 4-13, 2016. We invite you to join us for what will be an extraordinary adventure into the secrets of ascension in the spectacular countryside of Southwest England, including visits to Avebury, Glastonbury, Stonehenge, Salisbury, Winchester Cathedral, plus a whole lot more! 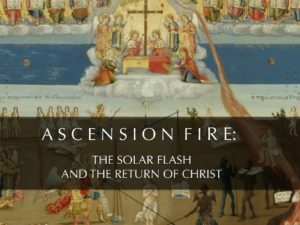 Our focus will be on the ascension mysteries and the Holy Grail, especially how they cross over into the time of Henry VIII, Anne Boleyn, Elizabeth I, Sir Francis Bacon and Dr. John Dee. If I could time travel, Tudor England would definitely be one of my top stops. Tea with Dr. Dee would be Uh-mazing. 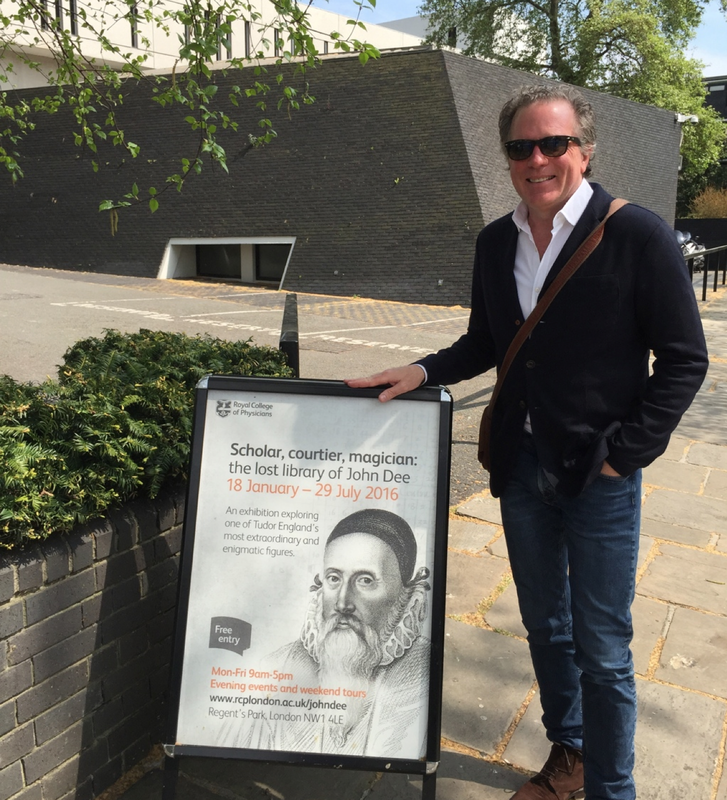 While preparing for the tour in London earlier this year, we had a chance to visit the Dr. John Dee exhibit at London’s Royal College of Physicians. The exhibit featured a selection of Dee’s lost books and his magical tools he used to communicate with angels. It was a most incredible experience. Dr. Dee was an astrologer/alchemist/magi to Queen Elizabeth I and the ultimate “insider” at the Tudor court. He was revered as the most learned man in all of Europe, his library being the greatest of Elizabethan England, if not of the world. He is known as the original ‘007’ and a true magi. Besides a scholar and a scientist, Dee was also a Christian occultist versed in Neoplatonic, Hermetic and Qabalistic philosophy and practice. His life mission dealt with apotheosis (human transformation into divine beings), the Apocalypse and the establishment of the New Jerusalem, the New Eden or Avalon, in England. 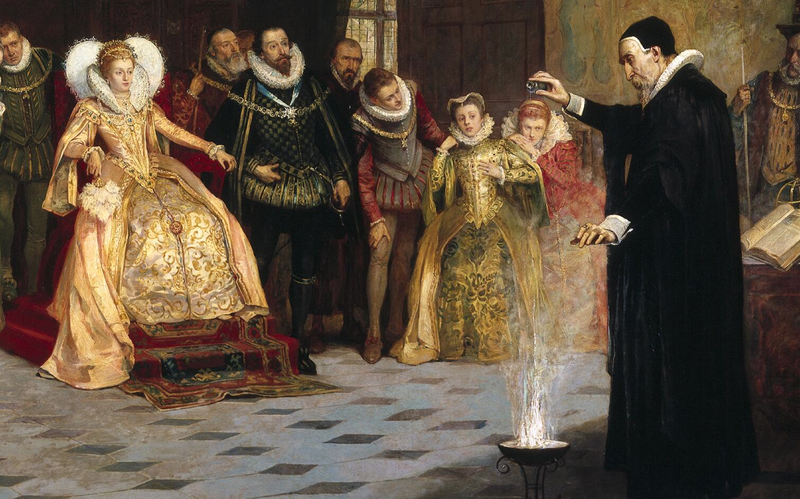 John Dee performing an experiment before Queen Elizabeth I.
Henry Gillard Glindoni, Wellcome Library. There is another reason why Clare and I made a bee line to see, or rather, experience, the precious few surviving books of his library. His books and ‘tools’ in the exhibit still hold Dee’s presence…and, possibly, the presence of even more mysterious beings. Dr. Dee was a Christian who communicated with the angels of Enoch, ephemeral light beings called Watchers, on behalf of his queen, and for the first time in history synthesized Judeo-Christian beliefs about these angels with the pre-Christian mysteries of the Renaissance magi. These are the same angels the Essenes claimed brought the secrets of heaven to earth, which were later taught to Jesus. As I discussed in “The Lost Secret of the Watchers,” these secrets have to do with human transformation into celestial beings. The Watchers seek to work with humanity to create or realize a new link between the human and the divine realms. As angels, the Watchers are classified as Seraphim, the highest order of angels. Known as the fiery or winged serpents, they are beings of pure light and pure love. In art, they are portrayed with whirling, vortex-shaped bodies covered with eyes. During the Renaissance the belief developed that our ultimate aspiration as humans was to transform into Seraphim. This could be accomplished by meditating on the love of God. In the early 13th century, St. Francis of Assisi had an encounter with the resurrected Christ as a Seraph, suggesting this is the key form in which these celestial beings appear to humans. Francis of Assisi saw the resurrected Christ as a Seraph. 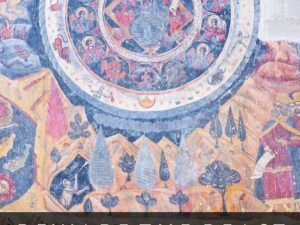 The angelic teachings of apotheosis or human transformation were discovered in the Dead Sea Scrolls of the Essenes and in the works of Dr. Dee, who taught them to Queen Elizabeth I.
Dee claimed he made contact with one of the Watcher angels on May 25, 1581. 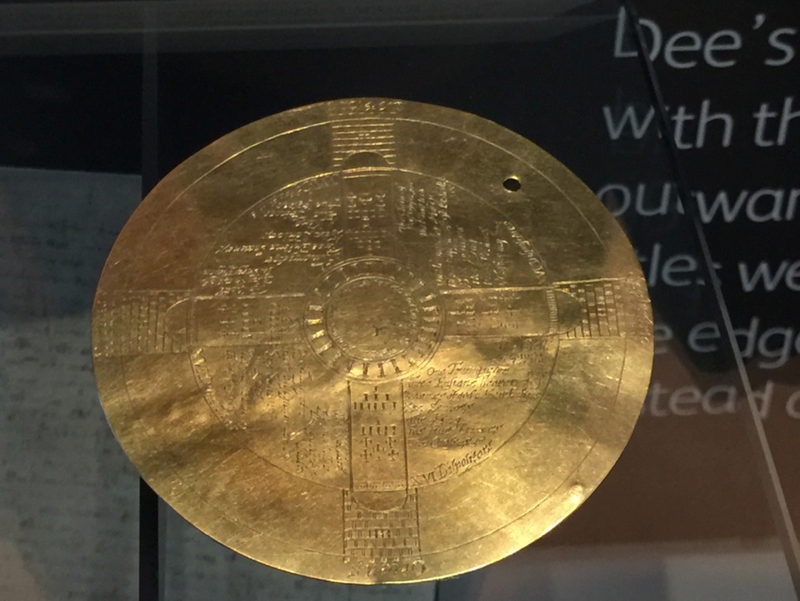 The magical mirror Dee used “to call his spirits” was displayed at the exhibit (it is normally kept in an nondescript wooden cabinet in the British Museum) along with a magical gold disk and the crystal he used to communicate with the angels. 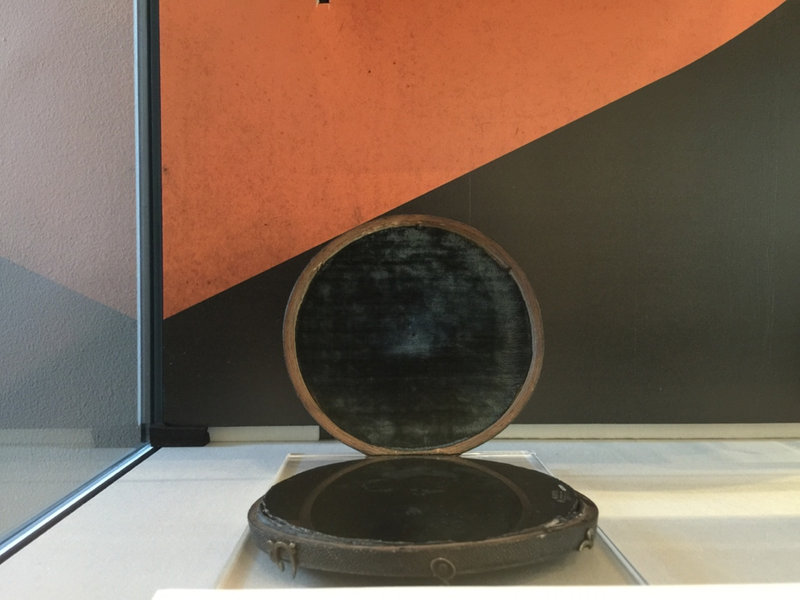 John Dee’s magical mirror. Photo by William Henry. John Dee’s magical gold disk. Photo by William Henry. 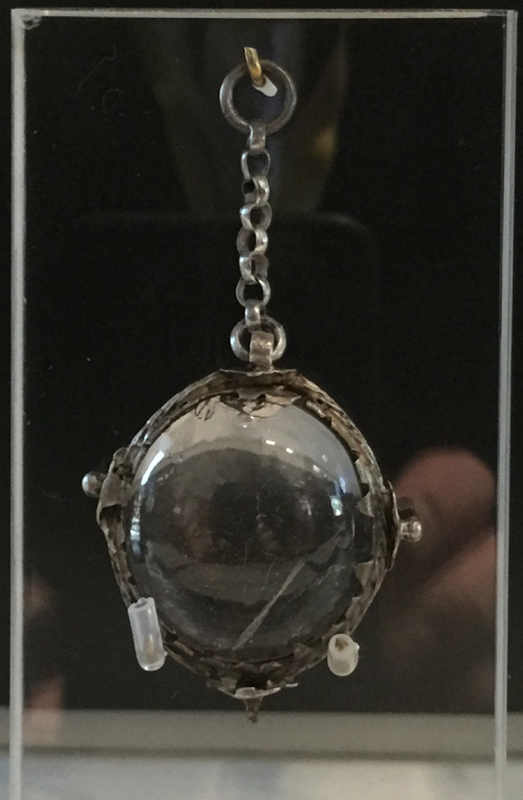 John Dee’s crystal given to him by the angel Uriel. Photo by William Henry. The crystal mesmerized us with the possibilities it represented. As I read the placard in the museum cabinet, my eyes grew wide. According to his diary, Dee claimed this crystal was given to him by the angel Uriel in November 1582. Dee used the crystal for predicting the future by looking for symbols or the ‘ghosts’ of people in the stone. Bloody hell! We’re talking about an artifact from an extraterrestrial contact and the bloke who wrote the placard acts like it is a token from a gum ball machine! That, or the writer knows that if you are standing in front of this case you know exactly what you are looking at. 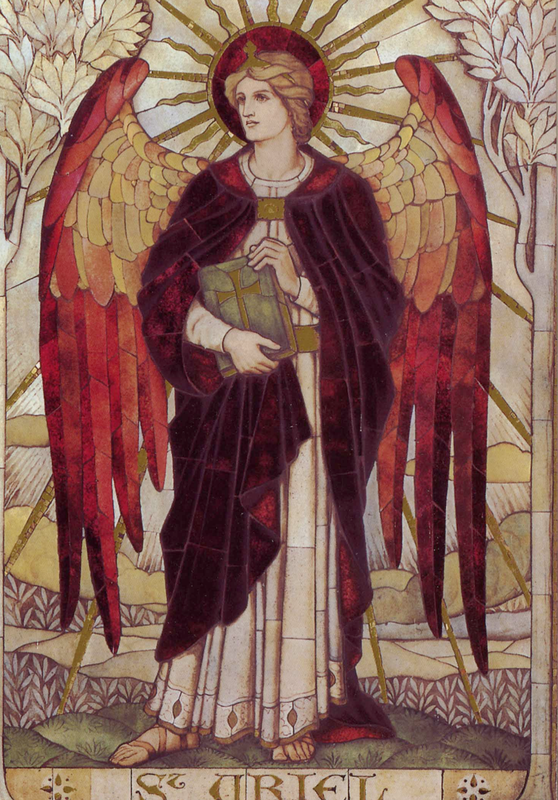 Uriel (whose name means ‘Fire of God’ or ‘Light of God’) was the same Watcher angel who guided the prophet Enoch, the first human to be translated to heaven and to have his body changed into an angelic light body. S/he usually holds a book contain the wisdom or Arcanum of the universe. This is the Arcanum that produces the light body of the angels. Dee taught these secrets to Queen Elizabeth I.
Uriel. St. John’s Church, Boreham. Another placard said Dee and Edward Kelly also claimed that Uriel instructed them on how to make the Philosopher’s Stone. Now, this left me gobsmacked (British speak for surprised beyond belief). As Clare and I explored in our GaiaTV show, ARCANUM, in Tibet the Philosopher’s Stone is called the Chintamani or Wish Fulfilling Jewel and produces the perfect Rainbow Body of Light, in which people dissolve or transform their flesh and blood bodies into new bodies of light. This transformation usually occurs after death, but it can also be accomplished by the living. The symbol of the Chintamani is the triple dots or triangulated dots. 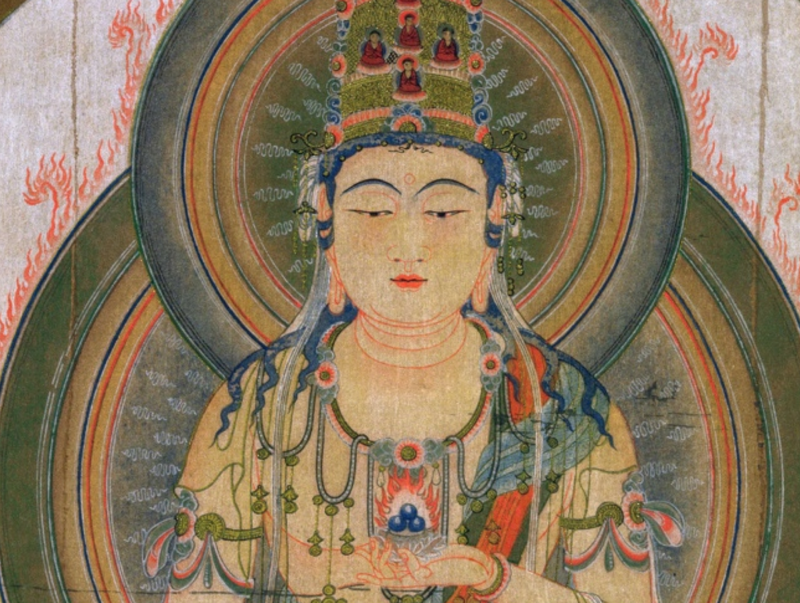 When seen on the cloak of a Buddha it indicates he is wearing the Rainbow Light Body or Robe of Glory, as it is also known. Padmasambhava in the Rainbow Body. The Philosopher’s Stone produces the Rainbow Light Body. 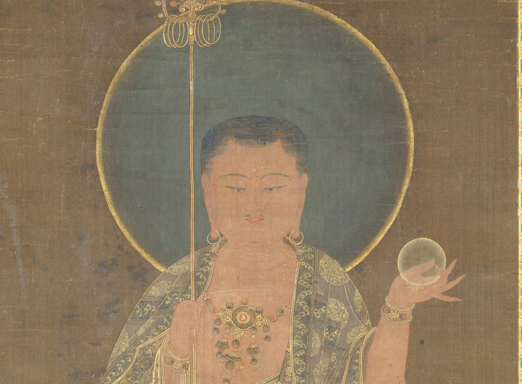 Boddhisatva holding the flaming Chintamani or Philosopher’s Stone. 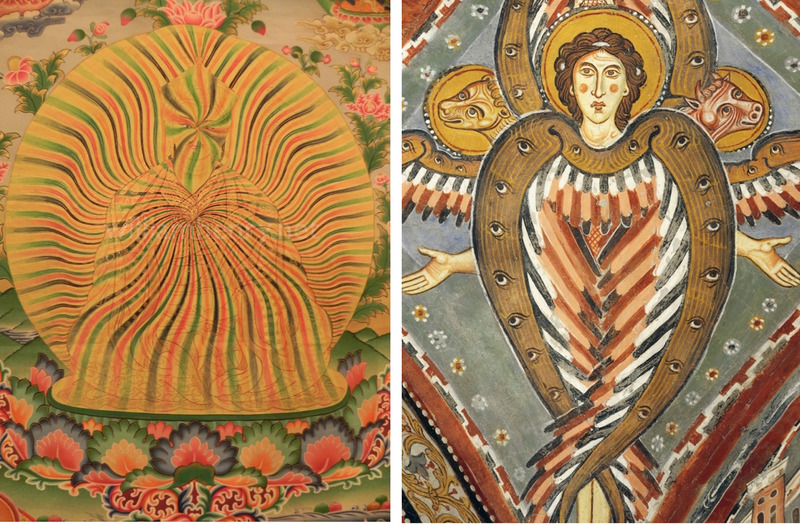 As I have shown for many years in my books and presentations, the whirling, vortex-shaped bodies of the Seraphim match the swirling body of light of the Tibetan Rainbow Body tradition. I believe they have the same types of bodies. This glorious rainbow body is the same as the resurrection body of Christ. 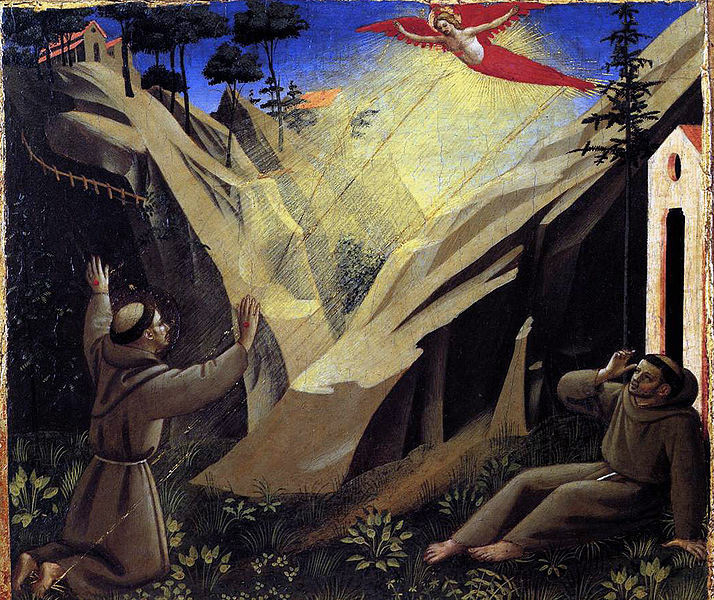 This explains why the resurrected Christ appeared to Francis of Assisi as a Seraph. I don’t have space here to go into details, but the Chintamani is the source of the Holy Grail mysteries. We will fully explore this connection during our tour. 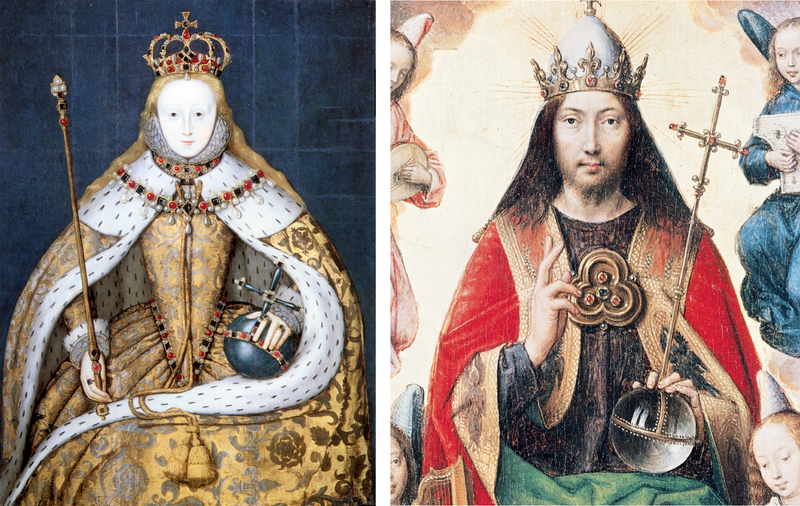 Under the guidance of Dr. Dee, the Tudors envisioned themselves as descendants of King Arthur and the Holy Family of Christ and purveyors of the Grail mysteries, especially in its aspect as the Stone of Transmutation. A recently discovered ‘lost’ painting by Leonardo da Vinci, now in the National Gallery of Art, London, shows Jesus with the transparent orb or Stone. When Clare first saw this painting, before it was authenticated, she immediately recognized this as a lost Leonardo and she spotted the triple dots of the Chintamani. She was right on both counts. Leonardo appears to be telling us something quite profound about Jesus and the Stone. 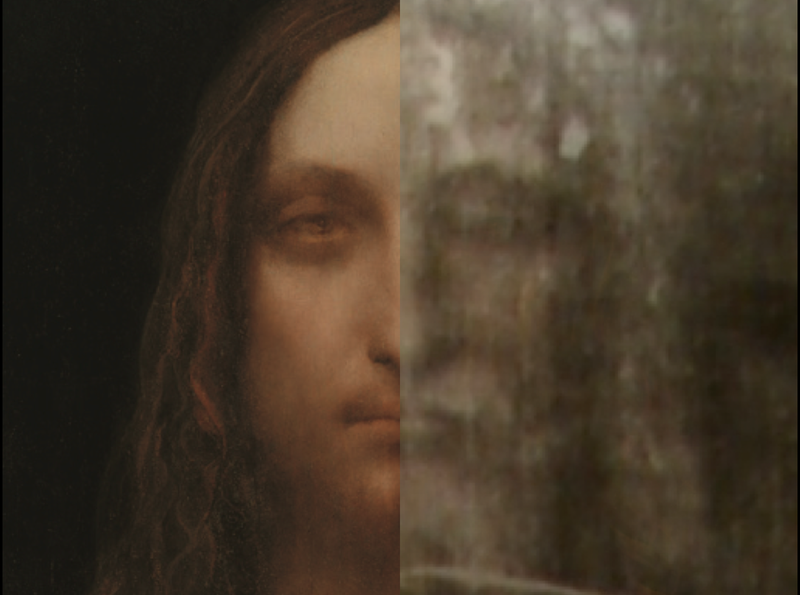 The face of Leonardo’s Christ matches the face of Christ imaged onto the Shroud of Turin. Current scientific research is directed at understanding the Shroud as an artifact of Jesus dissolving his body into light and ‘beaming’ it through the Shroud, leaving behind the image of his physical body as it turned to light. Boddhisattva and the Chintamani. Leonardo’s Jesus and the Chintamani, National Gallery, London. Now that we know the meaning of this crystal sphere, we can understand its significance wherever we see it. 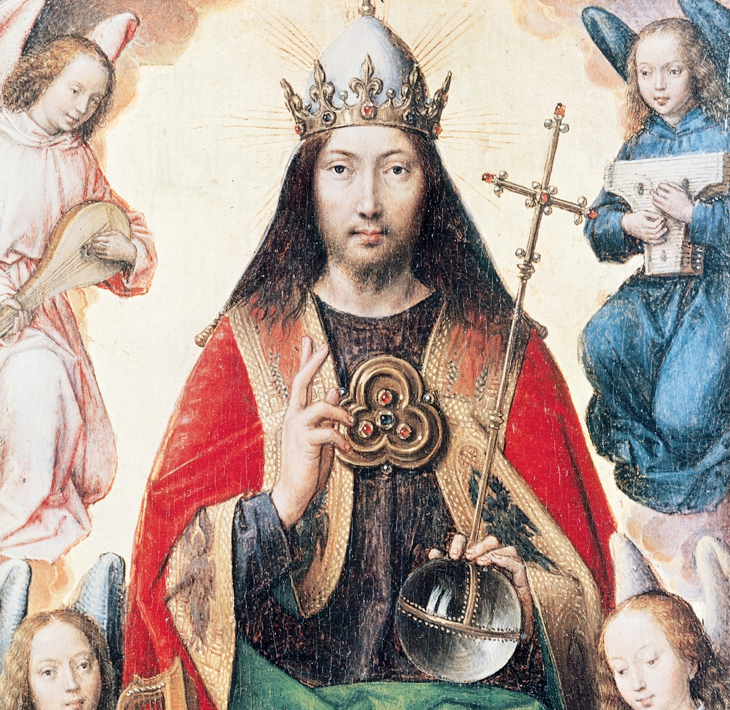 For example, in depictions of Christ in Majesty, he wears the Crown of Salvation and holds a crystal orb topped by the cross. In Rogier van der Weyden’s version, for example, we see the triple dot symbol of the Chintamani. Again, the secret of this stone is the secret of transforming or transmuting the human body into the light body of the angels. Dee knew this. Perhaps Uriel gave him a miniature version of this stone? So, we must conclude the Tudors were working with angels and one of the Great Secrets of the Tudors is their understanding of the light body. And that crystal sphere of Dr. Dee? Well, that may well be the most astounding artifact of otherworldly contact ever known. Two pieces of Tudor art speak directly to their understanding of the symbolism and meaning of Christ’s Resurrection body or Body of Light. Dee was probably behind the symbolism found in both paintings. 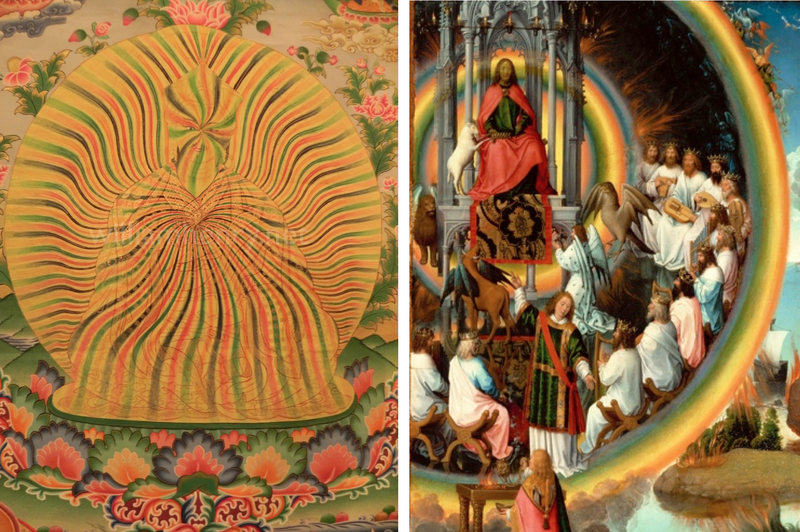 The first is “The Rainbow Portrait”, by Isaac Oliver, an allegorical representation of Queen Elizabeth as her alter ego, Astraea, the virgin goddess of classical literature. The name Astraea means “star maiden” or “star child”. Elizabeth Tudor was sixty years old when she sat for this painting, but Oliver portrayed her as eternally youthful and more than mortal. The Rainbow Portrait, Isaac Oliver. She holds a rainbow over which is the inscription, “No Rainbow Without the Sun”. The rainbow’s colors — black, red, white– are the three stages of alchemical transmutation: purification, illumination, perfection. A jeweled serpent is entwined in the infinity pattern along her left arm, and holds from its mouth a heart-shaped ruby. Above its head is a celestial sphere. The colors of the serpent — black, red, white — repeat the three stages of alchemical transmutation. Elizabeth’s cloak is covered with eyes and ears, implying that she sees and hears all. However, knowing that Dee was ‘channeling’ the light body secrets of the Seraphim, whose bodies are covered with eyes, we have to claim this meaning as well. 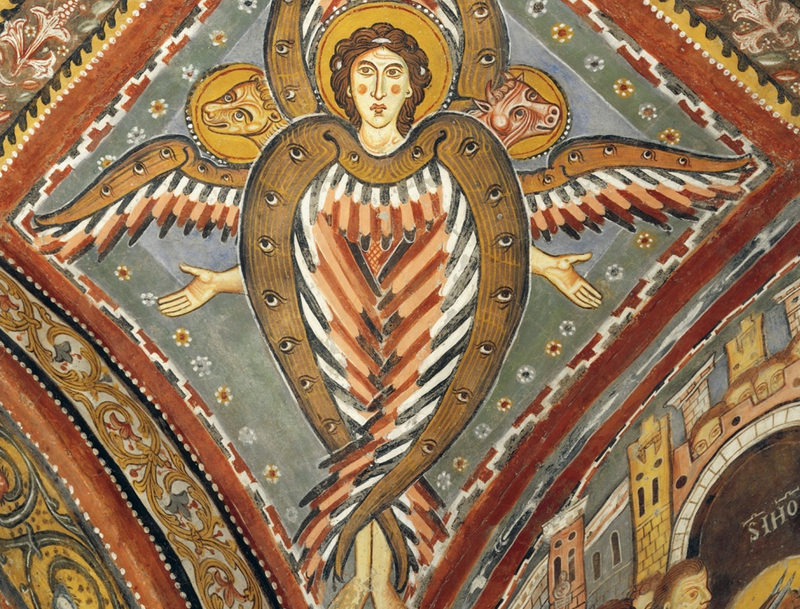 As Dee knew, the Seraphim are called the “winged or feathered serpents”. To me, the placement of the alchemical serpent on her sleeve sends a clear message. The combination or sum of all of this symbolism — the rainbow, the eyes, the serpent — tells me that Elizabeth is portrayed as a transmuted being, a star child, but also as a Seraph. There is much more encoded in The Rainbow Portrait, but that is best left for our visit to Hatfield House when we will see — and experience — exactly what Dr. John Dee intended. 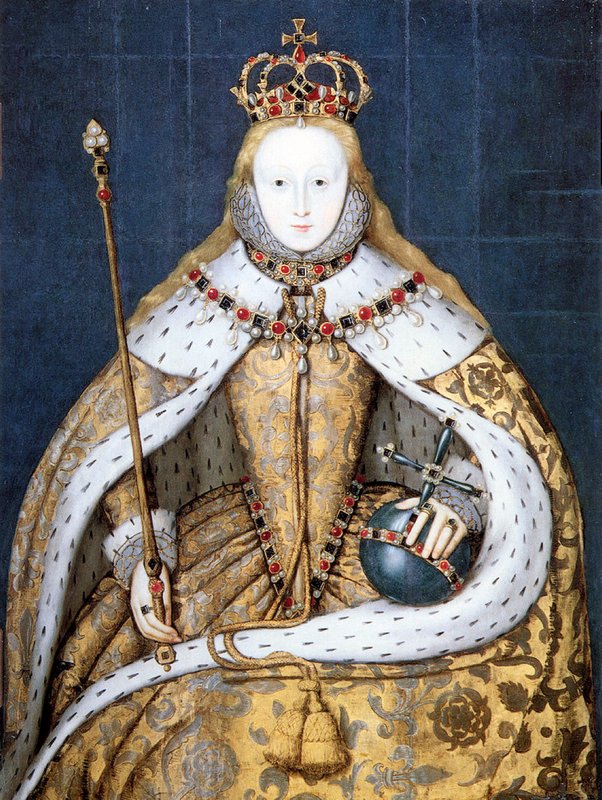 The other painting is Elizabeth I enthroned in her coronation robes emblazoned with the pentagonal Tudor rose. She wears the ermine robe of royalty, the royal crown and holds an orb with a decorated with precious and semi-precious stones. The orb is surmounted by a cross, representing Christ’s rule over the world. What many do not realize is that the Coronation of the kings and queens of England is a carefully scripted Christian rite that transforms the royal into a representative of Christ on earth. This is why this portrait of Elizabeth matches the meaning and symbolism of Christ in Majesty. 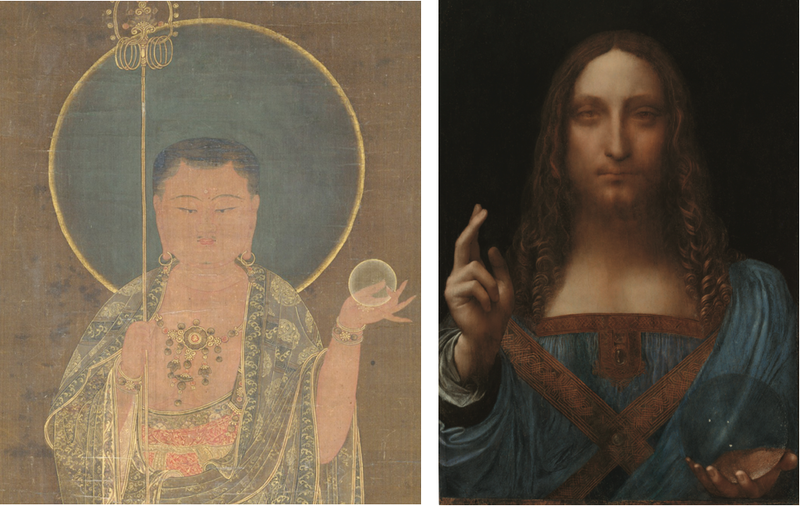 As noted, the crystal orb in Christ’s hand is the Chintamani or “wish fulfilling jewel” in Buddhism. It is symbolized by three dots arranged in a pyramid. This is exactly the symbol atop of Elizabeth’s scepter. The triple dot is also the symbol for ermine or the cloak she is wearing. 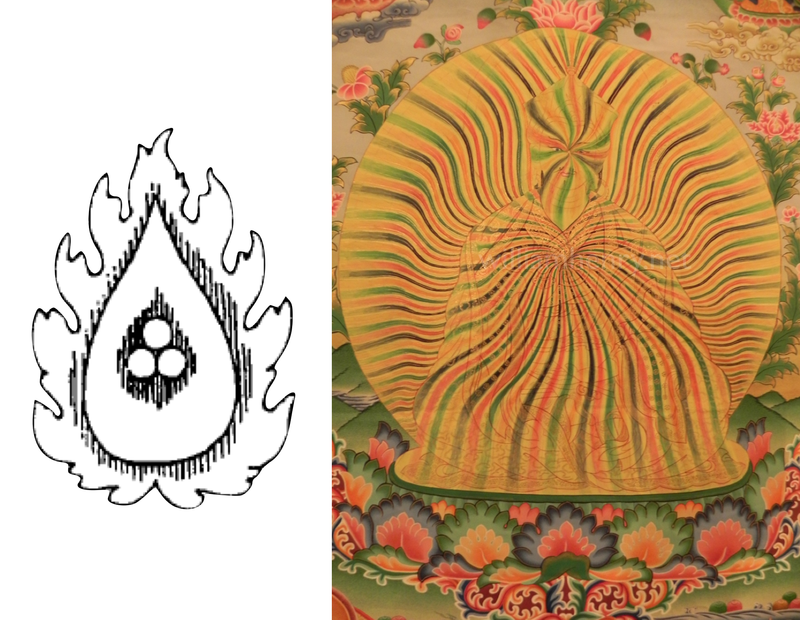 In Buddhism, when the triple dot symbol is worn on a cloak it symbolizes the attainment of the light body. 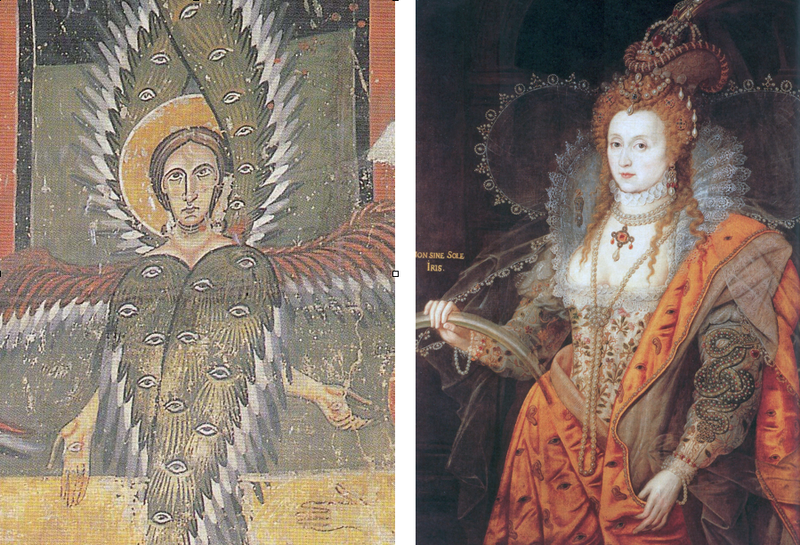 This is the hidden meaning of Elizabeth’s ermine cloak (and Mary Magdalene’s, as well). 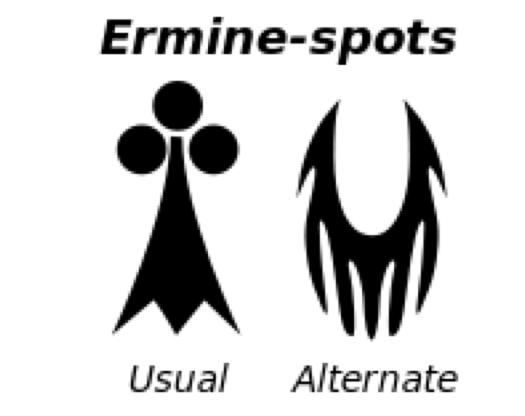 The usual symbol for the ermine spots is the triple dot symbol of the Chintamani. 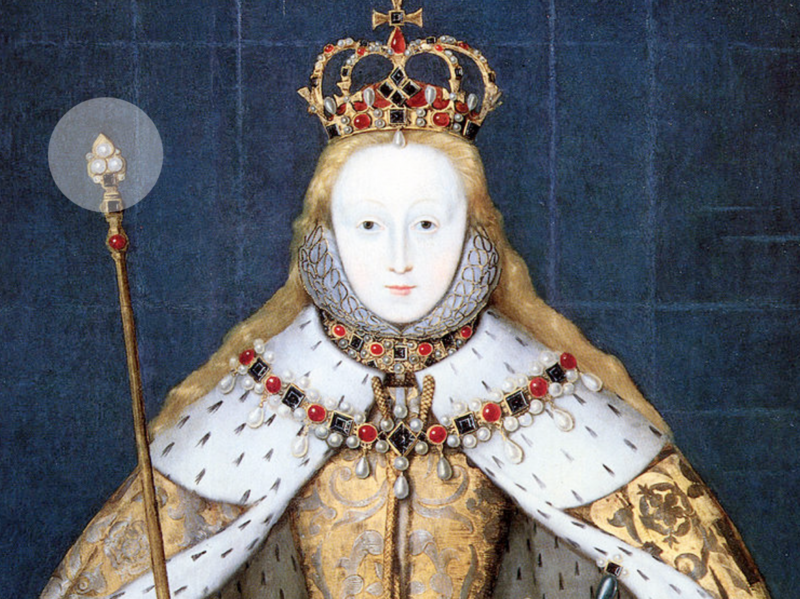 To me, this is a clear sign that the star child, Elizabeth I, is wearing the cloak of light. This symbolism can be applied to all British Monarchs, including Elizabeth II. Most do not realize that the Coronation of the British Monarch is a Christian ceremony or sacrament (initiation rite) in which the Monarch is enthroned on the Coronation Chair. Said to contain the stone upon which Jacob had a dream of Watcher angels, it draws another direct connection between the British Monarchy and the angels. The Coronation progresses with an anointing with holy oil followed by the vesting with the royal robe. Next, the orb, symbol of the world under Christ, is presented, followed by a ring and scepters or rods. Finally, the crown is placed on the monarch. The monarch now becomes the living representative of Christ on earth. This sacrament is Christian-based, but its symbolism is traced to the kings of Egypt. 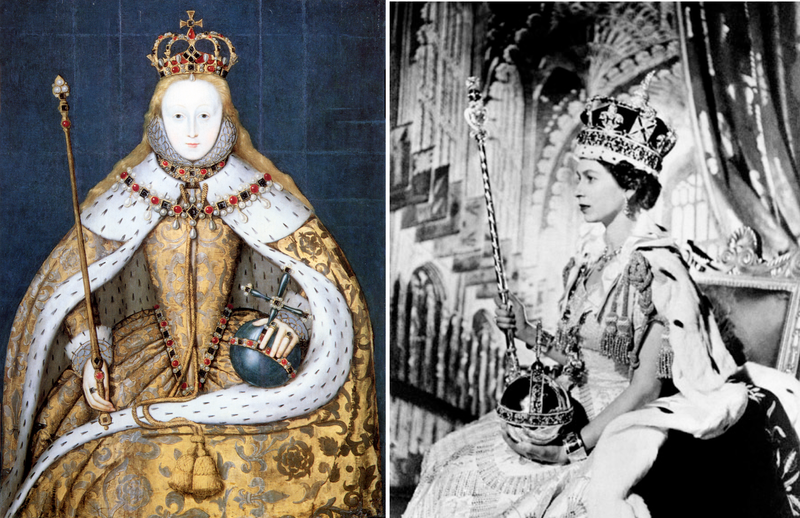 The coronation of Queen Elizabeth II in Westminster Abbey in 1953 was the first ever to be televised, and was also the first major international event to be broadcast on television. Prince William and Kate Middleton’s 2011 marriage was watched by 340 million, or as many as 2 billion viewers, world wide. The next Coronation is bound to be a massive global event. It could even be a mass initiation in which millions or billions of people connect the dots with this symbolism and realize that the crown, orb and rod are within all of us. Lawyers for secularists are already calling for the next Coronation to be non-religious and stripped of its Christian symbolism. 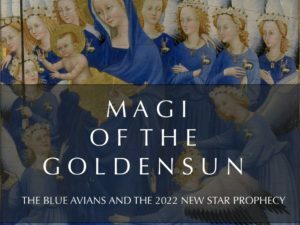 As more and more is being discovered about England’s crucial role in the ascension of humanity, my revolutionary research brings a whole new understanding of the importance of the light body in the myths of Avalon, the Grail, the lost history of the Tudors. There is a lot more to share. 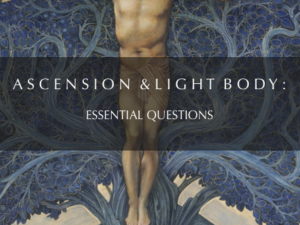 Join us for our “The Ascension of Avalon” tour and explore more of these ascension teachings which will provide you with deep sacred knowledge of the light body as a powerful antidote to our changing world. Fascinating post – thank you! 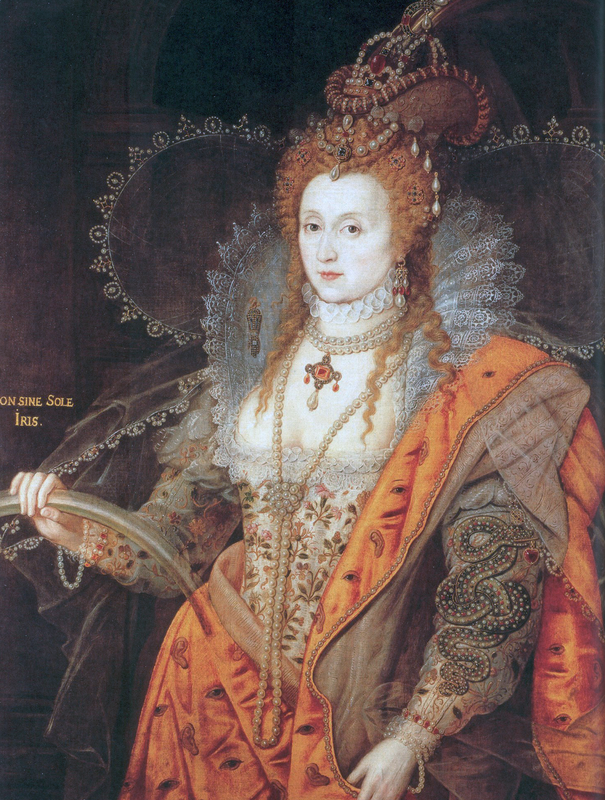 🙂 I did notice one thing you may find interesting – when you describe the painting of Elizabeth I here: “A jeweled serpent is entwined in the infinity pattern along her left arm, and holds from its mouth a heart-shaped ruby.” It occurs to me that the “heart-shaped” ruby dangling from the serpent’s mouth is actually an apple. I’d say it represents knowledge and references the serpent offering wisdom in the Garden of Eden. The three pointed pyramid or triangle is also an important masonic symbol. Thanks for doing & presenting all this great research! Fabulous!